Mandarake is a chain of stores in Japan that act as resellers. Due to the items being secondhand, they are often much cheaper than buying the item new, even when shipping is taken into account. This guide will show you how to successfully navigate their site and find the goodies you’re looking for. First off, there are two versions of the website to choose from, the Japanese version and the “global” or English-language version. The English site is much easier to navigate if you don’t speak Japanese but some items may not show up in searches. Especially if you’re hunting a rare or harder to find item, it can be useful to find out what it’s called in Japanese and find the kanji search terms for it. For example, I can search “Kamen Rider W” and get one set of results, but I get a few different items in a search for 仮面ライダーW. If you are shipping to the United States (or really any country that isn’t Japan), be sure to enter the Global site to create your account. If you enter through the Japanese side it won’t format your shipping address correctly since that side of the site is set up for Japanese formatted addresses. Once you have an account, you can go browse and search on the Japanese side. Just make sure once you have everything in your cart and you’re ready to check out, you go through the Global side so it will format the address correctly. Second, there are different branches of Mandarake. Each store ships separately and this is important to remember. If you find two items you like at Nakano and three at Grand Chaos, you will not be able to combine them into one order (you check out, pay, and ship each store’s wares separately). Luckily the website has good filtering options, and you can easily narrow your search to a particular store. Often an item will be listed at multiple stores, and recently Mandarake started adding a link to those other listings right on the page. Once you’ve found your items and put them in your cart, it’s time to check out. Mandarake is a little different because of the nature of the site – it’s a chain of actual physical stores in Japan. With the exception of Sahra, you will be placing your order and waiting to pay until they gather your items. While in your shopping cart, you can edit the list of items. If there are any items that are must have, and you don’t want everything else if you can’t get that one item, be sure to check the box that says “cancel the order if this item is out of stock.” If you check that option, and the item you want has sold from the store before they pull your order, you won’t get penalized for a canceled order. The checkout process is fairly simple. Step one is to confirm your address. You can have more than one saved to your account. Step two is your choice of payment and delivery options. For payment, there’s PayPal or credit card. 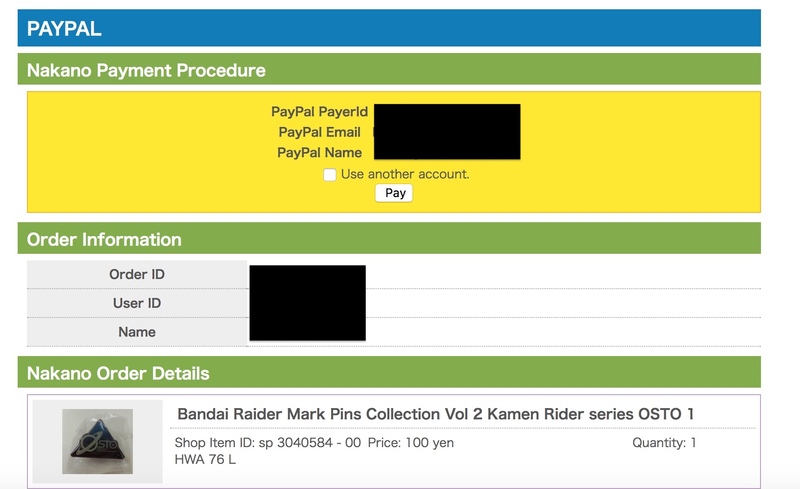 I find PayPal is best because many credit cards will reject Mandarake charges for fraud since it is a Japanese charge. Depending on your bank/card issuer, you may have to call and authorize the charge. PayPal is easiest and you can have it go on a credit card still. However, if you are purchasing 18+ doujinshi, you cannot use PayPal because there is no age verification. Note that Mandarake will not charge you at this point. The shipping is the other tricky part of the checkout process. Mandarake offers three shipping options – DHL, EMS, and SAL. They will not quote shipping ahead of time, so you really have to make your best guess as to which is best. SAL is the cheapest, but there are restrictions. SAL is not fully tracked, you might get a couple of updates when it leaves Japan and when it enters the U.S., but very little beyond that, and it takes a long time, usually two weeks or more. EMS and DHL are much faster, though a little more expensive. However, they are also fully tracked and more insured so your package is safer. So how to choose between EMS and DHL? It’s tricky, and I admit I don’t always pick correctly. But a big part of it is knowing what you’re ordering and picturing how it will be packed. There are two factors in regards to the shipping fee – volume and weight. DHL shipments get more expensive the more volume your package has. A lightweight box that is two feet long will cost more than a ten-pound box that’s the tiniest box size. EMS shipments go by weight, they generally start at 2000 yen and go up the heavier the package is no matter the size. What does that mean for choosing your shipment? If I’m ordering a bunch of books that will weigh a lot but not need a big box, DHL is going to be cheap, maybe 1400 yen. But if I’m ordering a pillow or plushie that weighs next to nothing but is huge, then EMS is your better bet. It might be more like 2000 yen but that big featherweight box will be closer to 3000 yen from DHL. Once you choose your payment and shipping, the third page is the confirmation. It will give you the merchandise total with shipping fee as to be determined. Once you send it in, then you wait. Within three days, sometimes less, they will pull the items, pack them up, and send you a final invoice with the shipping cost included. Click on the link there and pay, and they’ll ship it pretty quick, usually by the close of business the next day after payment is sent. DHL gets to me about 24-48 hours after it’s picked up from the store, EMS tends to be about 3-4 business days, sometimes more, but usually within a week. Your speeds may vary though. Now, what about Sahra? From what I can gather, Sahra is not an actual store like the rest but rather a warehouse. The biggest difference is, you’ll get your shipping cost right there in the checkout. There’s not going to be an item sold out, because the Sahra items are not sitting in a storefront to be bought. So from Sahra, you pick your items, enter the checkout, and on page two it will actually give a shipping cost. This makes it easier to pick EMS or DHL because you can see right there which one is cheaper. On page three, instead of sending your list to the store you actually will pay for your items right there and then. They’ll pack up and send you an email when the items ship, usually within a day or two. Some last tips! One great (and also very dangerous) thing Mandarake offers is a notice list. You can save keyword searches in your account and tell them to email you whenever something that matches your search is listed. I have it set to email me about anything “Windscale” or “Kamen Rider W”. This can be helpful if you’re determined to find something that rarely gets listed – popular regular release Figuarts will pop up all the time, but Philip’s clothes are rare and get snatched up fast. The Mandarake stores don’t open until 12 or 1 pm and are only open until around 8 pm, soo if you place an order or pay for one outside of those times, nothing will be done until next business day. Mary Jo is a trained librarian currently working for an experiential marketing firm. When she's not at work, she loves to cosplay (mostly toku characters), take lots of photos, and staff conventions.